Teaching Authors--6 Children's Authors Who Also Teach Writing: Families that Read and Write Together_______? Fill in the blank! Families that Read and Write Together_______? Fill in the blank! All sorts of delicious treats (and maybe even tricks) await children and their families on the other side of midnight this Thursday, thanks to National Family Literacy Day November 1. Think: treats for the mind and heart, anytime, all the time. Sponsored by the National Center for Family Literacy, the day has been celebrated since 1994. Indeed the entire month of November celebrates Family Literacy. (1) Children whose parents regularly read to them during their first year of school make better grades in high school. (2) Children who grow up in homes with lots of books tend to go further in school. (3) Children learn from 4,000 to 12,000 new words each year as a result of reading books. How’s that for facts to help fill in the blank of this post’s title? All across the country, folks are booking family reading time. Family members are reading to each other – in their homes, in cars, on planes, trains and busses. Thanks to state Centers for the Book, public libraries, schools and bookstores, families are participating in read-a-thons and read-alouds. 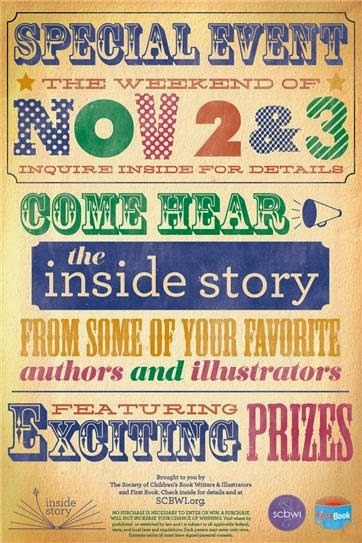 As for bookstore celebrations, this Saturday, November 2, my Writers Family – The Society of Children’s Book Writers and Illustrators – launches the Inside Story event at independent bookstores around the world. I’m honored to be joining fellow SCBWI-Illinois members Gina Bellisario, Marlene Targ Brill, Jeff Ebbeler, Dimitri Lunetta, Kevin Luthardt and Aaron Reynolds at Anderson’s Bookshop in Naperville to share the “inside stories” of our latest books. Click here to read the list of participating bookstores in Brisbane, Melbourne and Sydney, Australia – and – in the U.S., in Washington, California, New Mexico, Utah, Florida and Massachusetts. SCBWI’s Inside Story event is yet another opportunity for families to celebrate literacy. But even better, it’s also an opportunity to support literacy. For this first-time-ever bookstore event, SCBWI is partnering with First Book, the nonprofit organization that connects book publishers and community organizations to provide access to new books for children in need. For each book purchased during the Inside Story event, the bookstore will donate $1 to First Book. 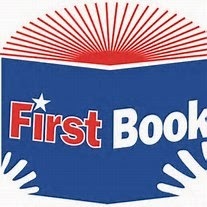 What does this effort mean for the millions of children who receive their first books from First Books? I’m happy to fill in that blank with the recipients’ words. “Books are better than Recess,” says Briana, who received new books from First Book – Monroe County. “Thank you for the books. I like to read. I like to keep the books,” says Jonathan Evans. book your Family’s Reading Time. Happy Reading and Writing, Family-style! I don't believe our Denver libraries are doing anything for this, but what a great program. I'll look at the Indie bookstores too. It is so critical, I know. When I think of the wealth of books my grandchildren have access to, in their own homes, in my home, etc., and I do donate books, hoping they do good for some child. Thanks for the reminder with the research! Here in Illinois, and not just in November, the Secretary of State's office works with the Illinois Center for the Book to make sure Family Reading Nights take place across the state.